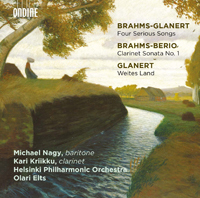 Description: Glanert’s dramatic preludes provide rich and stylistically apt introductions to Brahms’ late Old Testament settings and close them with a postlude as well. Continuing to demonstrate his identification with the late Romantic composer, in 2013 Glanert wrote “Distant Country”, an 11-minute piece with the subtitle “Music with Brahms for Orchestra”. This takes its thematic and harmonic material from the first eight notes of Brahms’ fourth symphony and functions as a moody refraction of German late Romanticism through the prism of the early, post-romantic 21st century. Quite approachable. German-English texts. Michael Nagy (baritone), Kari Kriikku (clarinet), Helsinki Philharmonic Orchestra; Olari Elts.